The search continues for the three US soldiers attacked on Saturday near Mahmoudiya. The missing US soldiers from Mahmoudiya (left to right): Alex Jimenez and his wife Yaderlin Jimenez -Via IraqSlogger, Pvt. Byron W. Fouty, and Pfc. 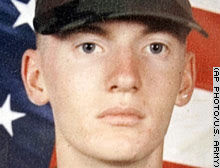 Joseph J. Anzack Jr..
A fourth soldier identified as killed in an Iraqi ambush that left three other troops missing had a great sense of humor and the “metabolism of a god,” his platoon leader said Friday. The Army told family members Thursday that Sgt. Anthony J. Schober, 23, of Reno, Nevada, was among the dead from Saturday’s attack, said his uncle, Robert Schober of Minden, Nevada. …With Schober’s identity known, the following soldiers can be identified as missing, or “duty status whereabouts unknown”: Spc. Alex R. Jimenez, 25, of Lawrence, Massachusetts; Pfc. Joseph J. Anzack Jr., 20, of Torrance, California; and Pvt. Byron W. Fouty, 19, of Waterford, Michigan. Rest in peace, Sgt. Anthony J. Schober. Military officials are optimistic that the 3 missing US soldiers are still alive. On Thursday, U.S. officials expressed cautious optimism that the missing soldiers were still alive even as troops drained canals and questioned children in the search. FBI agents and Australian forensic experts also took part in the operation. About 900 people had been questioned so far and 36 were detained, Webster said. U.S. forces also dropped 250,000 leaflets over the area. Also today… The trial of Iraqi Al Qaeda terrorist Abu Nur or “The Spider”, begins today. The “Spider” orchestrated between 800-900 bombings in Iraq before he was captured! Al Qaeda Claims It Is Holding Missing US “Crusader” Soldiers! !